Sandals of BiColor style (two tone) differ from Light line for the combination of dipped colors with metallic laminated leather. The laces are colored separately after which they are assembled and sewn to the natural sole of clear color. BiColor style There are 12 products. Red and white greesed vachetta leather men's flip flop sandals with thongs braid around the big toe and natural leather sole handmade in Italy by experts in the best tradition of craftsmanship. Mud color greased vachetta leather flat sandals with orange laminated leather band and leather sole handmade in Italy by experts in the best tradition of craftsmanship. Two tone tan and black greased cow leather women's flat sandals with leather or rubber sole handmade in Italy by experts in the best tradition of craftsmanship. 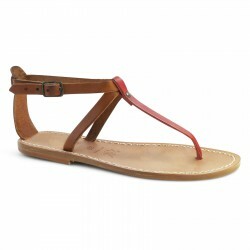 Two tone tan and red greased cowhide leather thong sandals for women with leather or rubber sole handmade in Italy by experts in the best tradition of craftsmanship. 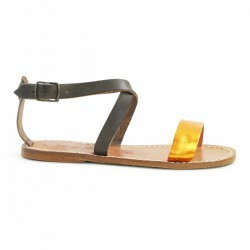 Two tone tan and silver greased cow leather women's flat sandals with leather or rubber sole handmade in Italy by experts in the best tradition of craftsmanship. Two tone tan and white greased cowhide leather thong sandals for women with leather or rubber sole handmade in Italy by experts in the best tradition of craftsmanship. Two tone black silver cowhide leather thong sandals for women with leather sole handmade in Italy without the use of foreign labor or child, but by experts in the best tradition of craftsmanship. Two tone tan and dark brown cuir greased vachetta leather men's Jesus sandals with leather sole handmade in Italy by experts in the best tradition of craftsmanship.